The Variety Challenger Baseball Field in Vancouver really is a Field of Dreams — and I’ve been to the actual Field of Dreams movie site in Dyersville, Iowa! The first of its kind in Western Canada, it was the brainchild of the Vancouver Canadians who, with help from the Vancouver Park Board, the Jays Care Foundation, and a boost from Variety BC, have created a new permanent baseball field for The BC Challenger Baseball Program, a program devoted to children with physical, developmental and intellectual disabilities. I spoke with Andy Dunn, Partner & President of the Vancouver Canadians about how this dream came to fruition. He told me that he knew Ian McLean, National Coordinator, Challenger Baseball Canada for years and eventually something just clicked. One day Andy had the opportunity to have a long discussion with Malcolm Bromley, General Manager, Vancouver Board of Parks and Recreation around the time that the Park Board was looking at revamping Hillcrest. 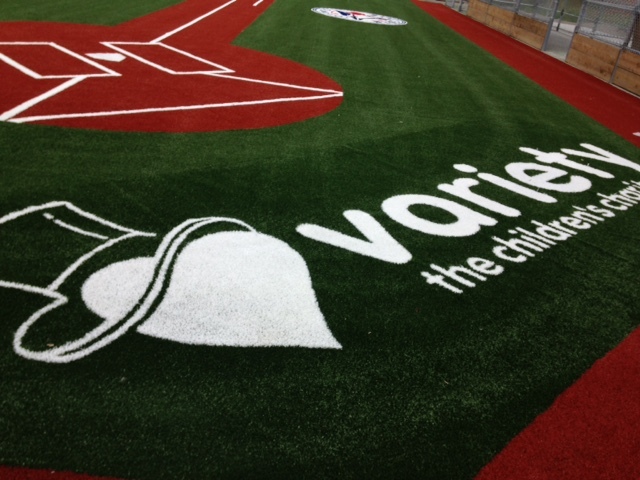 A project that involved a baseball field for kids with physical and cognitive disabilities. They went to work with Hillcrest, Little Mountain Little League, and funding partners Jays Care Foundation and the Park Board but were still short on funding until Variety stepped up to the plate. Because of the generosity of these parties, kids will be able to play on a fully turfed field, with extra wide and deep dugouts so the kids can all be together. “The main part about being a part of a team is not so much the at-bats and that other stuff, it’s the camaraderie of being a teammate,” Andy explains. Having an accessible ballpark allows kids to be part of so much more than 9 innings of baseball. This past weekend, Variety – The Children’s Charity hosted its 51st Show of Hearts Telethon and raised over $5 million for BC kids with special needs. This is just one of the many initiatives that Variety supports. You can still support anytime by donating online or by texting “KIDS” to 45678 to give $20 automatically. Follow the Vancouver Canadians on Facebook and Twitter to follow the team throughout the year for their latest updates and to hear more about their support for all of the Vancouver baseball community.